Roof and Pipe boots are some of the most common causes of roof leaks. Pipe collars often become warn and rusty which causes cracking. The pipe collar cracking causes water to leak through and slowly destroy the interior walls of your home. Roof Pipes are often the source of roof leaks. 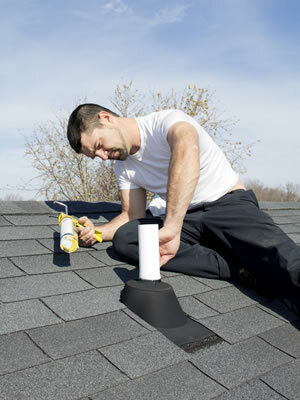 Specialty Roofing Repair can examine the vent pipes to find the exact problem areas. Many times the leak is in the collar at the base of roofing pipe. The collar is connected through the surface of the roof allowing water to seep through. The pipe collars are often made up of of a metal base, which is usually aluminum, plus a rubber boot meshed into the tip of the collar. The pipe collar’s purpose is to produce a close-fitting seal, not allowing rainwater and debris to leak in your attic. Contact to the sun and severe weather can cause the rubber boot to fall apart and deteriorate. If this happens rainwater can leak in between the rubber boot and the vent pipe and into in your home, causing harm. If the rubber boot collar is cracked or damaged, Specialty Roofing Repair can offer the best solutions to save your home and assets. Debris can sometimes be the reason for pipe leaks in the Myrtle Beach area. If there isn’t enough room between the base of the roof piping and the shingles then debris can get trapped. Debris can cause water to puddle and form roof leaks during storms. A professional like Specialty Roofing Repairs can bowdlerize and caulk the area around the shingles which will open the space for water and debris to flow out. Pipe flashings are one of the few parts on your roof where nails are left uncovered. If nail heads are not caulked water will rust the nail heads and cause a roof leak. We are experts at providing quick solutions like this to keep your home from suffering major damage.